WHAT/WHY: What do you get for $89 ($69 for child 5-11) in San Francisco – one of the most expensive – if not THE most expensive – city in the USA? Well, for one, unlimited rides on the historic cable cars, which can cost $7 per person, each time one jumps on: but only if you purchase a San Francisco CityPASS, which provides a 45% discount on four attractions and has other perks as well. Once used, this Pass is good for 9 consecutive days – but just be aware that the unlimited trolley/tram/Muni rides are only good for three consecutive days. Get Around By Public Transportation. Bus and Trolley drivers wave you in as you show your pass – much quicker and more convenient than having to fish through your purse or wallet for $$. Without the Pass, each time you jump on and off the “historic” trolley that travels from Market St. to Fishermen’s Wharf, you’ll have to pay $7, so it pays for itself if you use it enough. The Pass gets you three consecutive days of unlimited rides on cable cars, light rail, and Muni buses around the city. SFMoMA (or Exploratorium). The new 7-floor San Francisco Museum of Modern Art was erected in May 2016 and with soaring sunlit galleries, featuring contemporary art in all mediums, it is as compelling and overwhelming as MoMa/NYC in scope. If you are into modern art, you’ll find much to love here. Just be aware, that even with the CityPASS you must stand in line – sometimes for 30 minutes or more if very busy – to exchange the coupon for a ticket as there is no “fast-track” line. Alternately, the pass gets you into the venerable hands-on Exploratorium; an interactive science museum and Bay Observatory. California Academy of Sciences, Golden Gate Park. You could spend a whole weekend in Golden Gate Park and not see all of the institutions and gardens there, but carve out about three hours for this relatively new and exciting science museum, which covers everything from the stars to the rainforest. Enter into a great hall and you’re faced with two soaring spheres: one, a concrete planetarium, the other a multi-level glass encased rainforest Biodome. There’s a hall of taxidermied animals a la Museum of Natural History in New York, and the very popular Earthquake Simulator where you’ll experience the intensity of both the 1906 and 1989 earthquakes in a makeshift dining room. Downstairs, you’ll find an aquarium with the largest indoor coral reef in the world, tree-climbing otters, fancy pants penguins, and multitudes of sea life. Aquarium of the Bay. Most of the touristy stuff in SF is clustered around the Fisherman’s Wharf area, specifically Pier 39, which is also where you’ll find this incredibly fantastic aquarium. With illuminated tanks full of jellyfish and 300 feet of clear acrylic tunnels through which visitors experience rays, schools of anchovies, and other sea life swimming over and around them, this place is one fun museum and should not be missed. Blue and Gold Fleet Bay Cruise Adventure. 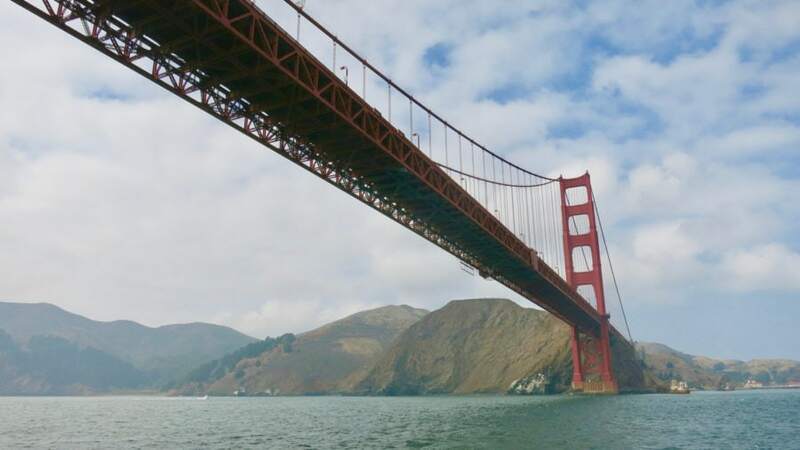 New York Harbor may have the Statue of Liberty, but San Francisco Bay flaunts the Golden Gate Bridge (and to a lesser extent, Alcatraz) on this hour-long cruise out to the iconic brick-red (not exactly golden) Bridge and back. If nothing else, you’ll get a sense of this City By the Bay ON the Bay – another perspective all first time visitors should experience. Pier 39 Seals: At most times of day, see mounds of seals sunbathing and sleeping on designated floating docks. Climb Streets: San Francisco is a city of hills, and there’s no better workout than a meander around town. If your lungs can handle it. Ghirardelli Chocolate Store: Founded here in 1852, it’s the chocolate company that has defined San Fran for over 150 years. EAT/BREAKFAST: Honey Honey Cafe and Crepery. In the Union Square area, this pancake/crepe spot has been a favorite morning meeting place for locals and tourists alike. EAT/VIEWS: Hana Zen. At the very end of Pier 39, this sushi place offers good Japanese food along with singular San Francisco Harbor views. Ask for a seat by the window for maximum impact. STAY: Sir Francis Drake Hotel. A Kimpton Hotel a block from Union Square, guests are guaranteed humor and whimsy along with design-forward luxury rooms and complementary wine and nibbles from 5-6pm. And at the Sir Francis Drake, it all begins with a doorman dressed in Beefeater finery. The Beefeater theme continues into a large center court lobby and bar, where a statue of same stands red and proud over guests checking in and enjoying drinks at cocktail tables and on couches. The top floor (21st) Starlight Room is one of the most popular nightclubs in San Francisco – another great advantage for those staying here and who merely have to take an elevator to get there. STAY: Stanford Court Hotel. After a complete renovation, this Nob Hill hotel is chic and cool – and innovative, as evidenced by the addition of a Kinima.Fit – an on demand virtual fitness trainer – in its redesigned Fitness Center. The brand new Kinima, now being installed in high-end hotels and workout facilities, tracks your reps, effort and calories burnt during your workout and uses artificial intelligence to customize your next workout. For fitness nuts, it’s one big reason to stay here.